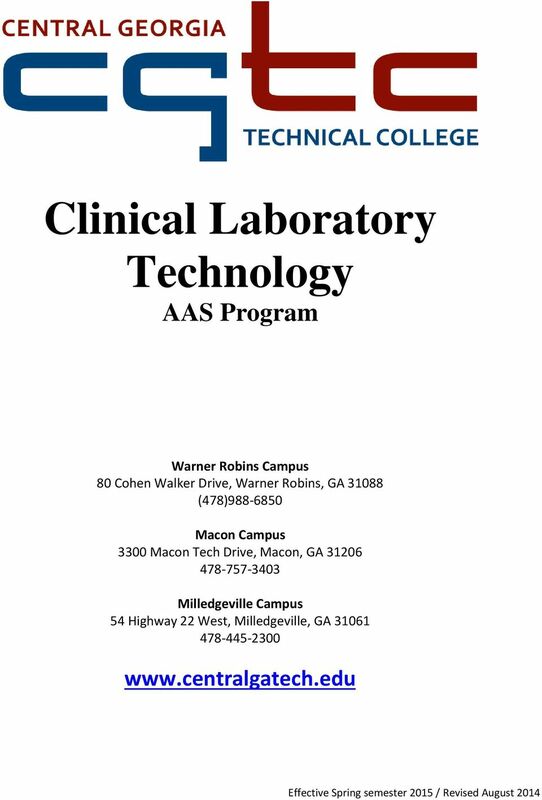 Download "Clinical Laboratory Technology AAS Program"
4 CGTC Clinical Laboratory Technology Program Selection Procedure Students are admitted to CGTC s Clinical Laboratory Technology Program through a process of competitive admission that includes three steps. Only those students who meet the minimum academic eligibility requirements (outlined below) will be considered for selection. 1) Successfully complete the following required core courses. ENGL 1101 Composition and Rhetoric or ENG 191 MATH 1111 College Algebra or MATH 1101 Mathematical Modeling or higher course such as calculus within the last five (5) years PSYC 1101 Introductory Psychology or PSY191 CHEM 1211 Chemistry I and CHEM 1211L Chemistry Lab I within the last five (5) years BIOL 2113 Anatomy and Physiology I and BIOL 2113L Anatomy and Physiology Lab I within the last five (5) years Transfer Credit: Core courses requested for transfer credit from another institution must meet the above criteria in order to be accepted by CGTC. 2) Complete the PSB Aptitude for Health Occupations Examination, Students may take the exam at any time, but no later than mid-term of the fall semester. Students may take the test two times in a year. The exam is administered in the CGTC Testing Center. 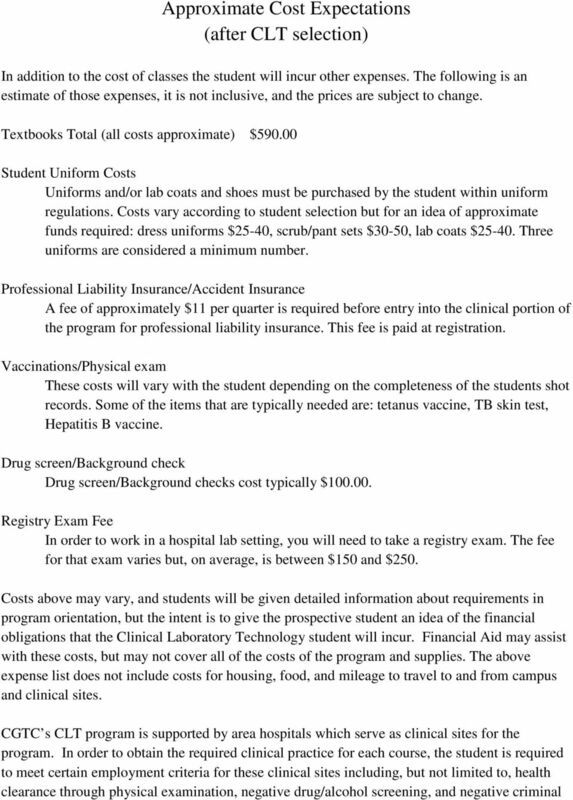 There is a $20 testing fee. PSB scores are valid for only one year from date of test. Students will be eligible to retest in one year. 3) Submit Progression/Application Form to the Admissions Office. a) Students will not be considered for selection for any given semester unless his/her name is on the list. 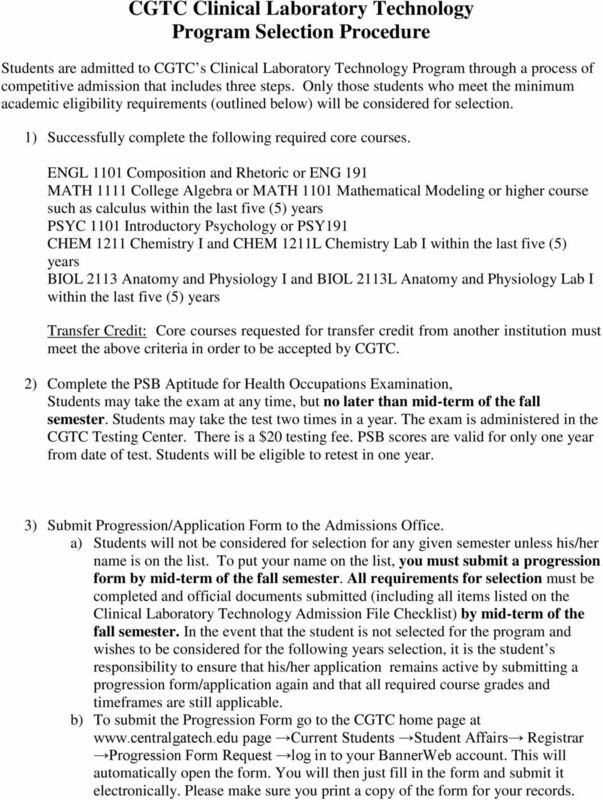 To put your name on the list, you must submit a progression form by mid-term of the fall semester. 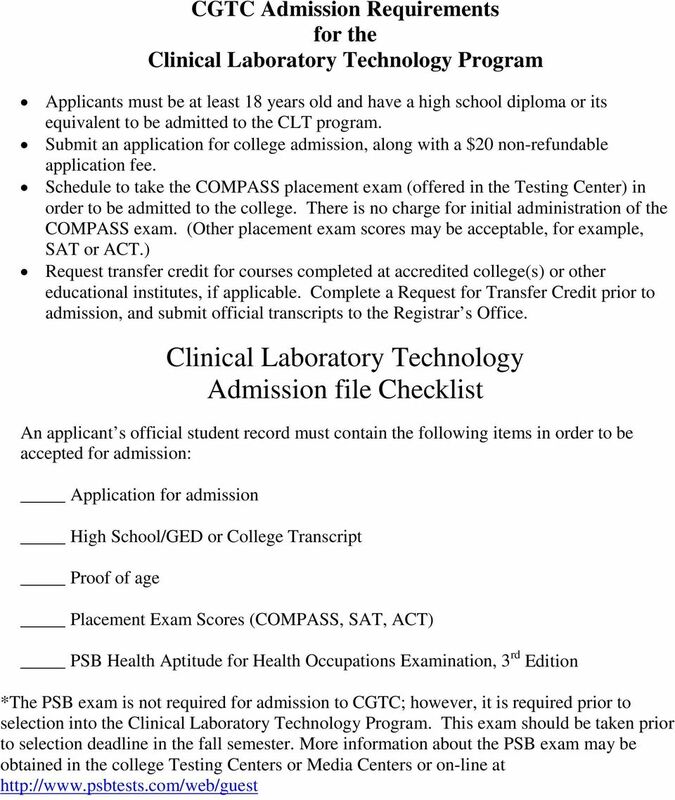 All requirements for selection must be completed and official documents submitted (including all items listed on the Clinical Laboratory Technology Admission File Checklist) by mid-term of the fall semester. In the event that the student is not selected for the program and wishes to be considered for the following years selection, it is the student s responsibility to ensure that his/her application remains active by submitting a progression form/application again and that all required course grades and timeframes are still applicable. b) To submit the Progression Form go to the CGTC home page at page Current Students Student Affairs Registrar Progression Form Request log in to your BannerWeb account. This will automatically open the form. You will then just fill in the form and submit it electronically. Please make sure you print a copy of the form for your records. 5 Selection Criteria Upon successful completion of the required core courses and having taken the PSB test, students will be considered for selection into the CLT program based on the following criteria: 1. Scoring will be calculated according to the following guidelines: a. Scoring: GPA X 100 plus highest PSB score. b. In the case of multiple attempts at a course(s) to achieve the required course grade or improve a grade, only the two most recent attempts will be calculated in the GPA. In the event that a student previously attempted coursework at institutions other than GGTC, official transcripts will be evaluated to include the two most recent attempts, and grades from any applicable coursework will be calculated in the GPA accordingly. c. Only courses taken within the required timeframe will be calculated in the GPA. In the case of English and Psychology, course grades for courses taken over five (5) years will not be computed in the GPA, unless it is the student s only grade for the specific course. 2. 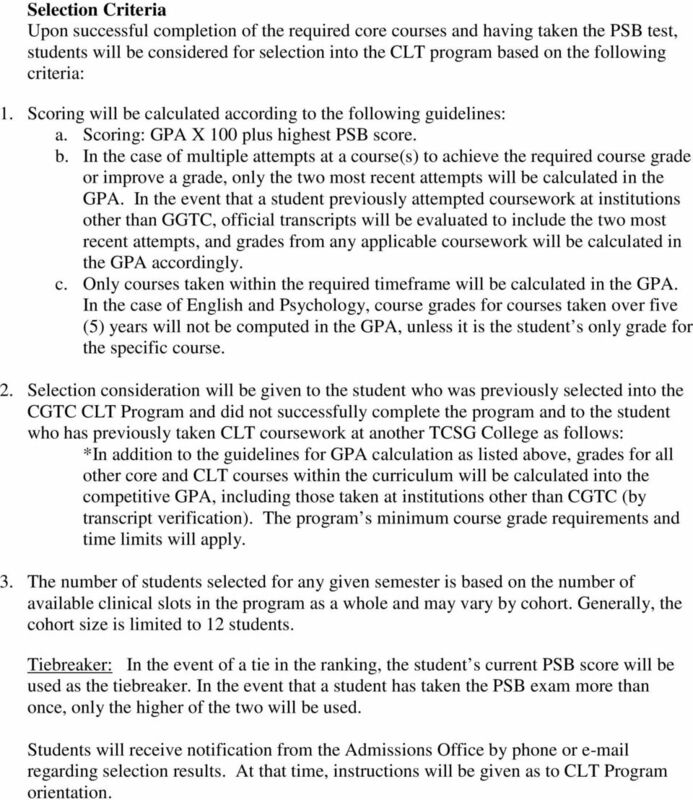 Selection consideration will be given to the student who was previously selected into the CGTC CLT Program and did not successfully complete the program and to the student who has previously taken CLT coursework at another TCSG College as follows: *In addition to the guidelines for GPA calculation as listed above, grades for all other core and CLT courses within the curriculum will be calculated into the competitive GPA, including those taken at institutions other than CGTC (by transcript verification). 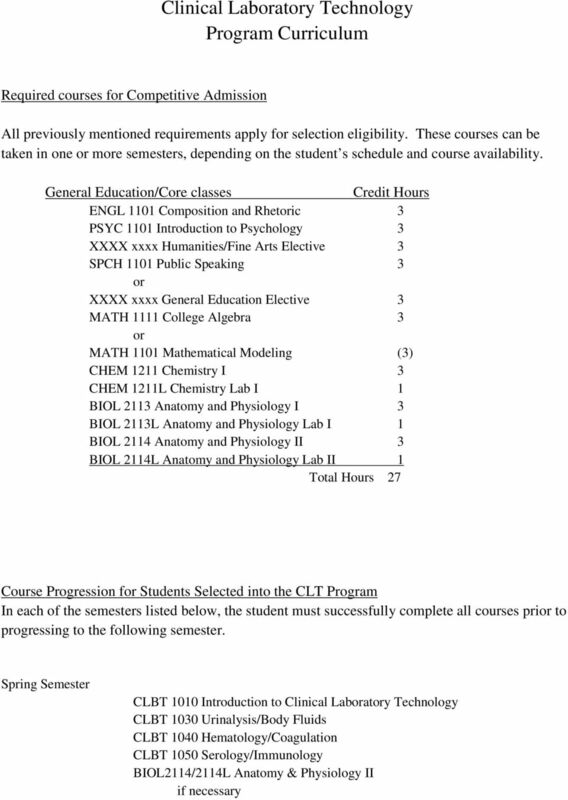 The program s minimum course grade requirements and time limits will apply. 3. The number of students selected for any given semester is based on the number of available clinical slots in the program as a whole and may vary by cohort. Generally, the cohort size is limited to 12 students. Tiebreaker: In the event of a tie in the ranking, the student s current PSB score will be used as the tiebreaker. In the event that a student has taken the PSB exam more than once, only the higher of the two will be used. Students will receive notification from the Admissions Office by phone or regarding selection results. At that time, instructions will be given as to CLT Program orientation. 6 Post-selection Requirements Following selection, in order to progress in the program, the student must maintain, for all required CLT, courses a minimum grade of C in each course. In the event that the student does not achieve a minimum grade of C for a CLT course, the student will not be allowed to continue, and will be required to reapply the following year. Transfer, re-entry (any break in successive semester enrollment), and transient students will be accepted into the program based on clinical slot availability. The student will be required to have completed any prerequisite courses, either core or CLT, that is appropriate for the entry point semester. 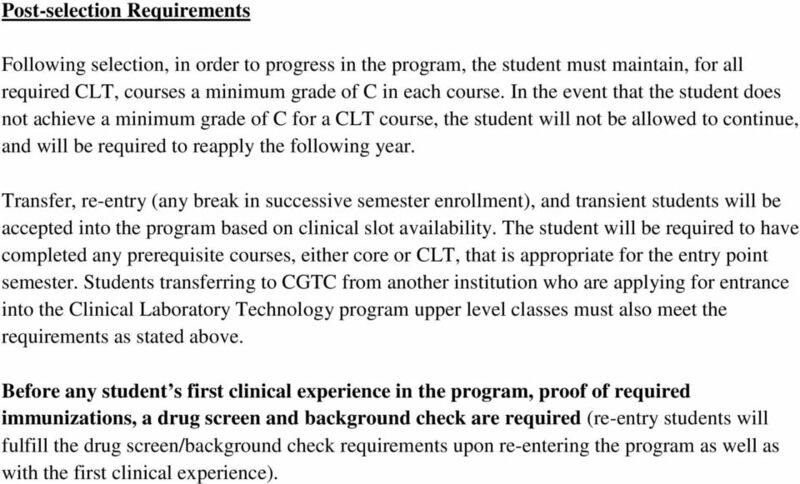 Students transferring to CGTC from another institution who are applying for entrance into the Clinical Laboratory Technology program upper level classes must also meet the requirements as stated above. Before any student s first clinical experience in the program, proof of required immunizations, a drug screen and background check are required (re-entry students will fulfill the drug screen/background check requirements upon re-entering the program as well as with the first clinical experience). 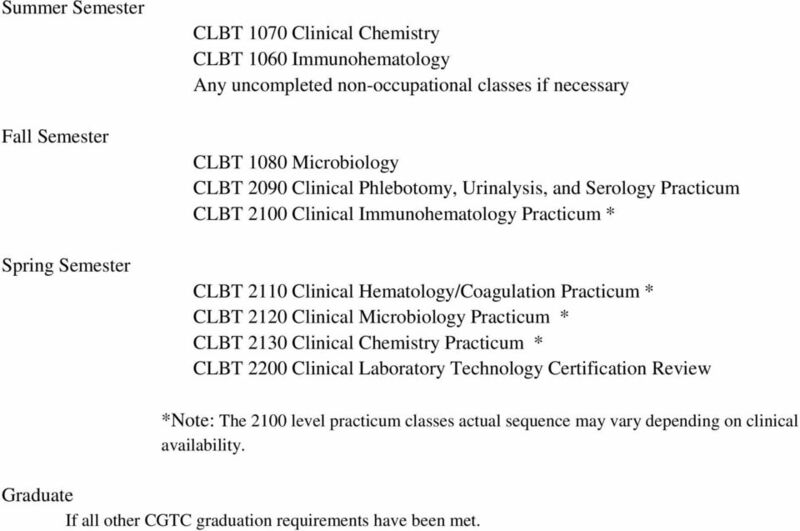 8 Summer Semester Fall Semester Spring Semester CLBT 1070 Clinical Chemistry CLBT 1060 Immunohematology Any uncompleted non-occupational classes if necessary CLBT 1080 Microbiology CLBT 2090 Clinical Phlebotomy, Urinalysis, and Serology Practicum CLBT 2100 Clinical Immunohematology Practicum * CLBT 2110 Clinical Hematology/Coagulation Practicum * CLBT 2120 Clinical Microbiology Practicum * CLBT 2130 Clinical Chemistry Practicum * CLBT 2200 Clinical Laboratory Technology Certification Review *Note: The 2100 level practicum classes actual sequence may vary depending on clinical availability. Graduate If all other CGTC graduation requirements have been met. 10 background history. The clinical sites (independent of the CGTC CLT program) determine those students who meet their criteria for clinical practice. 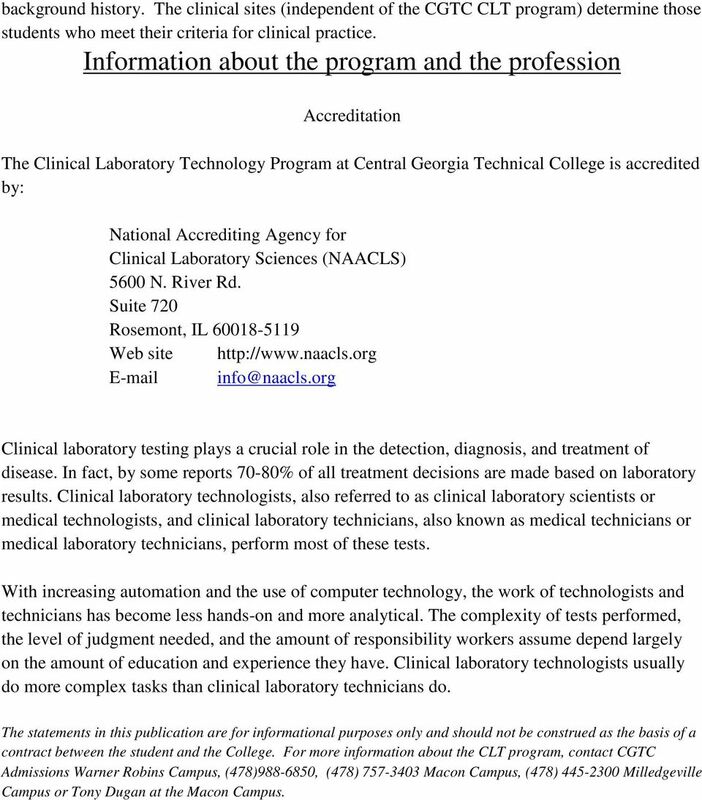 Information about the program and the profession Accreditation The Clinical Laboratory Technology Program at Central Georgia Technical College is accredited by: National Accrediting Agency for Clinical Laboratory Sciences (NAACLS) 5600 N. River Rd. Suite 720 Rosemont, IL Web site Clinical laboratory testing plays a crucial role in the detection, diagnosis, and treatment of disease. In fact, by some reports 70-80% of all treatment decisions are made based on laboratory results. Clinical laboratory technologists, also referred to as clinical laboratory scientists or medical technologists, and clinical laboratory technicians, also known as medical technicians or medical laboratory technicians, perform most of these tests. With increasing automation and the use of computer technology, the work of technologists and technicians has become less hands-on and more analytical. The complexity of tests performed, the level of judgment needed, and the amount of responsibility workers assume depend largely on the amount of education and experience they have. Clinical laboratory technologists usually do more complex tasks than clinical laboratory technicians do. The statements in this publication are for informational purposes only and should not be construed as the basis of a contract between the student and the College. 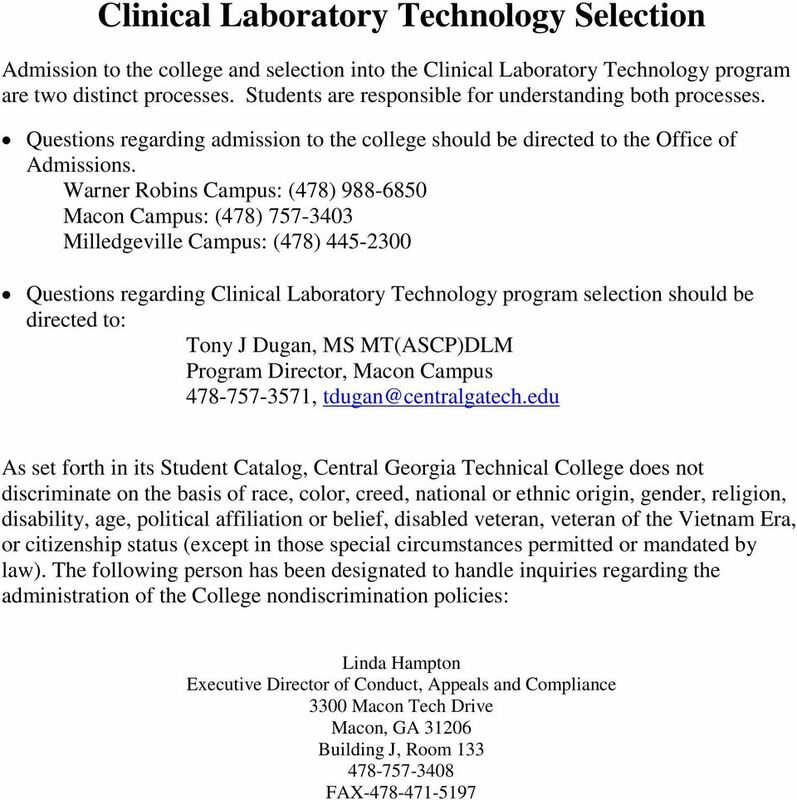 For more information about the CLT program, contact CGTC Admissions Warner Robins Campus, (478) , (478) Macon Campus, (478) Milledgeville Campus or Tony Dugan at the Macon Campus.